I came up with this recipe for Whole Foods Kid-Friendly Cherry Recipe Contest. The rules are that you must use at least a half-cup of fresh red cherries plus two other fresh fruits or vegetables in a kid-friendly recipe that has less than seven ingredients. Cherries are one of my favorite fruits and I like them so much on their own I rarely cook with them. Keeping that in mind I decided to come up with a light dessert with a lot of flavor and just the right amount of sweetness to make kids happy. 2. Wash all fruit. Slice peaches in half. Remove pit. 3. Cut out some of the flesh right in the middle so it makes a little hollow in the peach. Do not cut all the way through. 4.Chop up the flesh and reserve it in a mixing bowl. 5.Slice cherries in half and remove pits. Place the cherries in the mixing bowl. 6. Add blueberries, pecans, honey, and cinnamon. 7. Stir to combine all ingredients. 8. Scoop the fruit mixture into the hollow of the peaches. 9. 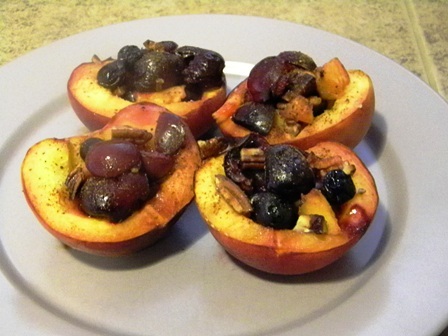 Sprinkle a little cinnamon over the to of the peaches. 10. Place in the oven and bake 15 – 20 minutes until peaches are soft.